Happy Friday, friends! I have several Love & Valentine’s Day Cards created for the Spellbinders Teach Me section (unfortunately, this section is no longer available). They have a really cool educational spot with Easy, Intermediate and Advanced cards using one die. 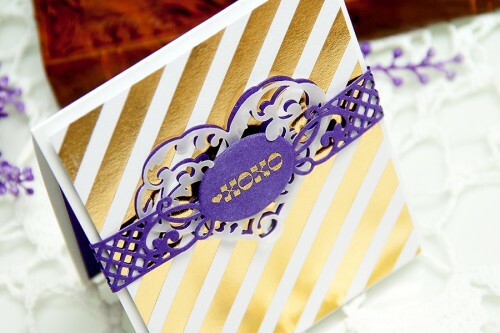 Create an A2 top folding card from an 11 x 4¼” piece of white cardstock. 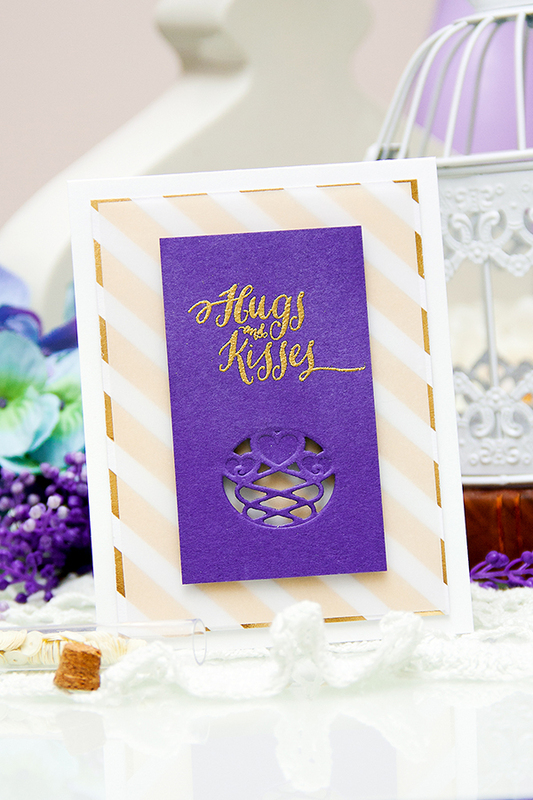 Trim patterned paper to 5 x 3 ¾ ” and adhere to card base using foam squares. Trim vellum to 4 ¾ x 3 ½ “ and adhere on top of patterned paper. Trim Delightful Daisy cardstock to 2 ¼ x 4”. Cut/emboss Romantic Agenda insert in the bottom part. Stamp and heat emboss sentiment in the top part. Adhere on top of vellum using foam squares. 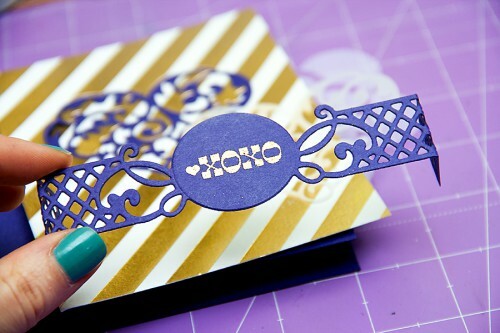 Trim patterned paper to 5 ¼ x 4 ”. 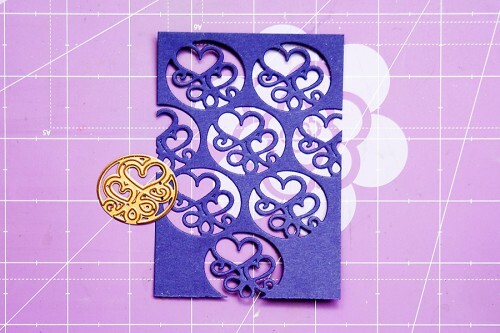 Cut Heart from the Heart & Flutter set in the top part of patterned paper and in a piece of Delightful Daisy cardstock. 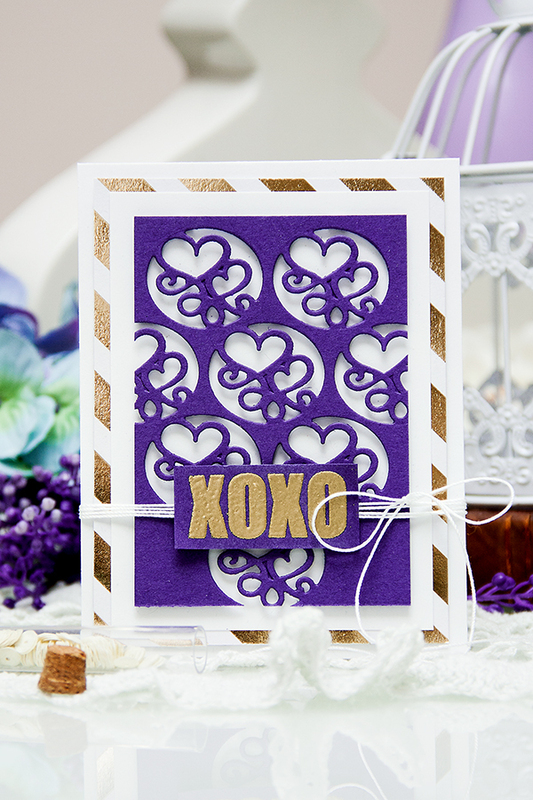 Create an inlaid look by replacing the die cut patterned paper heart with the cardstock heart in the patterned paper panel. Adhere to card base using foam adhesive. 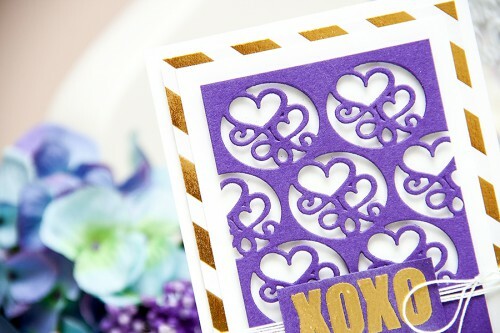 Cut Heart from the Heart & Flutter set out of vellum, adhere on top of the heart in patterned paper for a softer look. 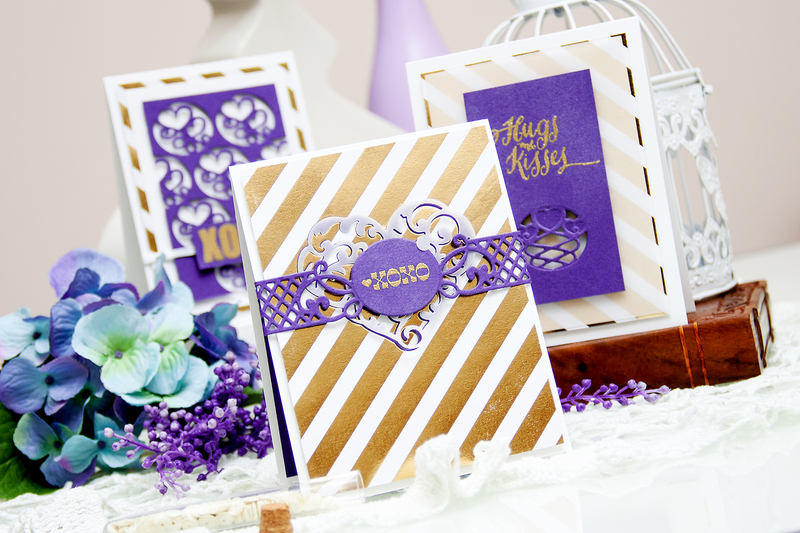 Cut/emboss Romantic Agenda die without the insert, stamp and heat emboss sentiment in gold. 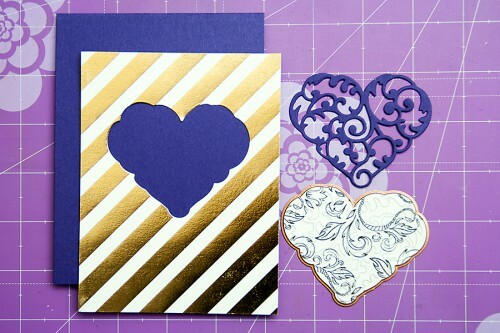 Adhere band on top of the heart using foam adhesive, wrap the ends around the card front. 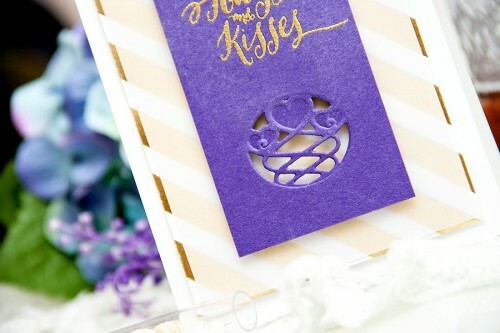 Secure on the inside with a piece of Delightful Daisy cardstock. 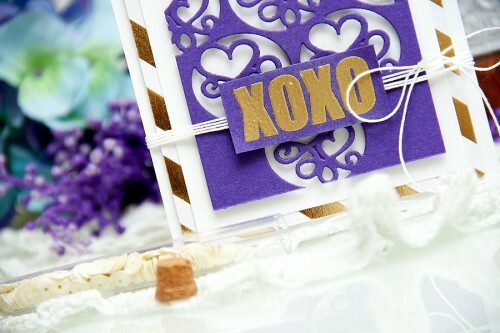 Trim patterned paper to 5 x 3 ¾ “ and adhere to card base using foam squares. 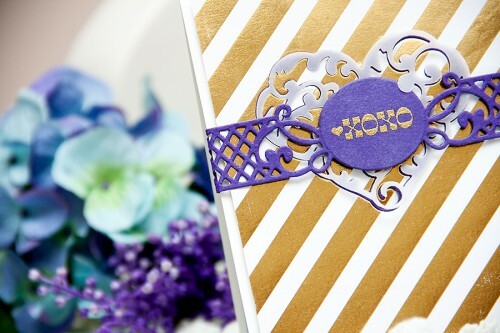 Trim white cardstock to 4 ¾ x 3 ½ “ and adhere to patterned paper. Trim Delightful Daisy cardstock to 4 ¼ x 2”. 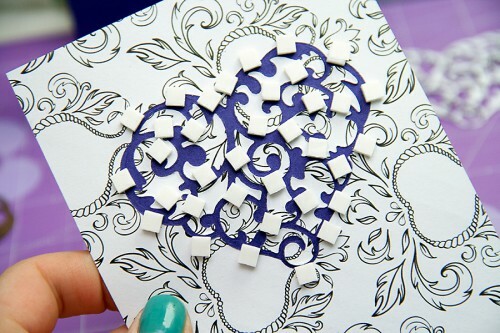 Begin by creating a custom die cut background by cutting an insert from the Romantic Agenda in the center. Continue cutting the same image on the cardstock panel until you have a full die cut background. Adhere background on top of white panel using foam adhesive. If needed, cut adhesive squares in half to fit in smaller spaces of the background. Wrap white floss several times and tie into a bow. Stamp and heat embossed sentiment on a piece of Delightful Daisy cardstock, adhere on top of the background using foam adhesive.